« The Classic Fits of the Mister Freedom® “CALIFORNIAN” Blue Jeans. 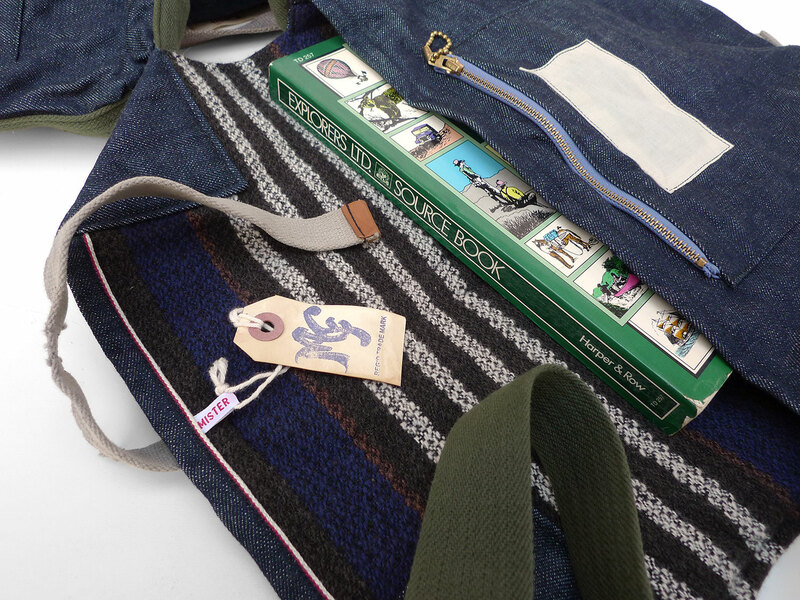 Mister Freedom® Laptop Haversack, NOS selvedge denim, 2018 stripe blanket edition. NOS selvedge denim x woven stripe wool-cotton blend blanket. To keep your laptop toasty for your up-coming Mars expedition, we have updated our popular LAPTOP HAVERSACK pattern with a cosy New Old Stock wool-blend blanket lining. 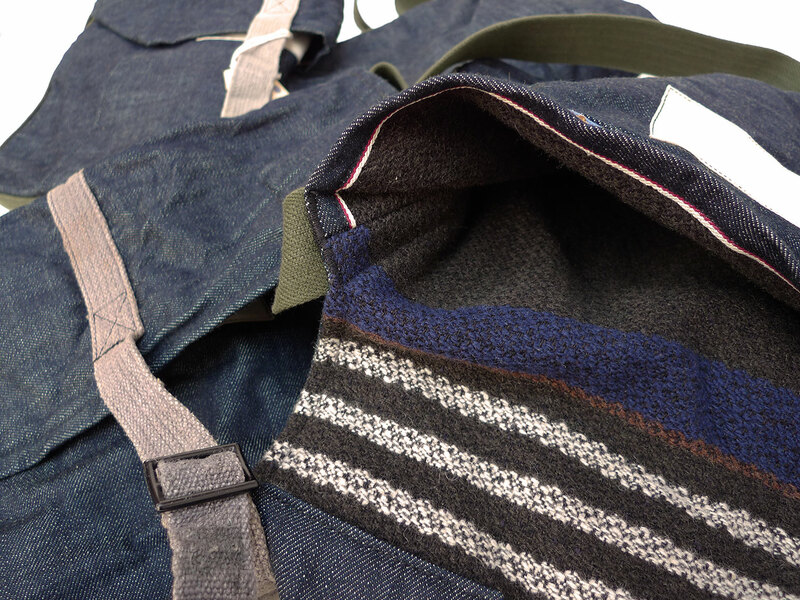 Our casual handy shoulder bag keeps the construction specs of its predecessor initially released in 2012. 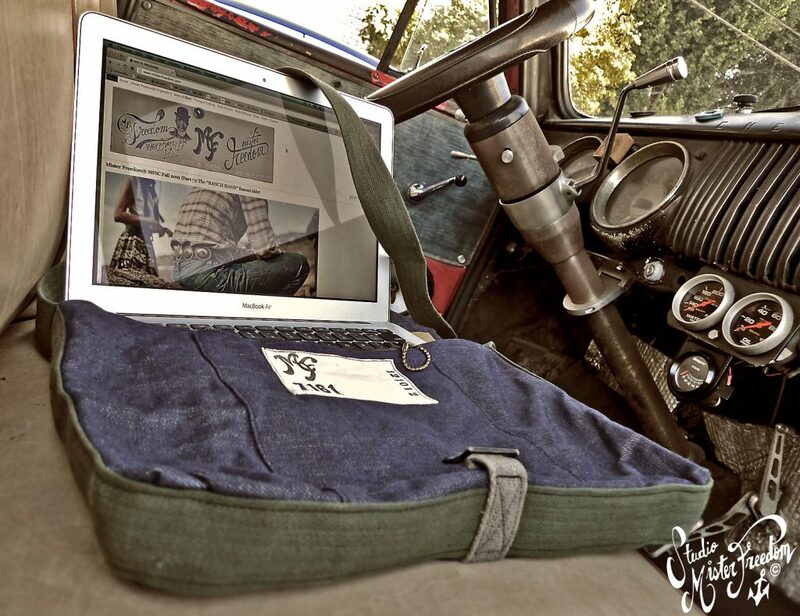 Its versatile size (approx 15” x 10” x 1.5”) allows this denim haversack to house the average contemporary laptop computer or iPad®. An electronic device or book measuring less than 15″ x 10″ will easily slide in the soft woolen blanket inner lining. A zip-up outer pocket will hold charger, USB, iPod and/or other supplies. Please note that the shoulder strap is not adjustable, but its length should work for most users with normal expectations. Our haversack is not shockproof, nor is it waterproof. So if you have an urge to boil it (?) make sure your computer is not inside. This lightweight bag is suitable however for storing and hauling around your portable computer gear while about town or travelling. 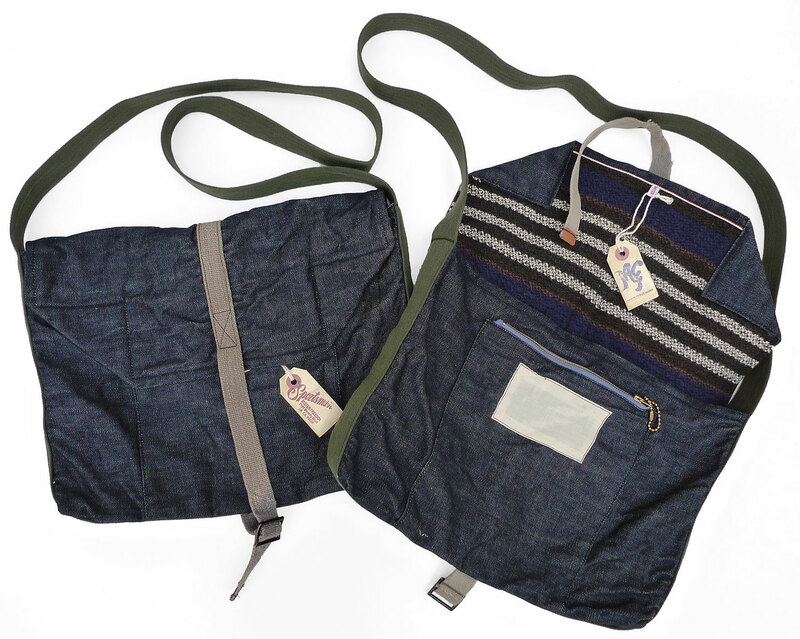 The bag is entirely built from recycled or New Old Stock supplies. 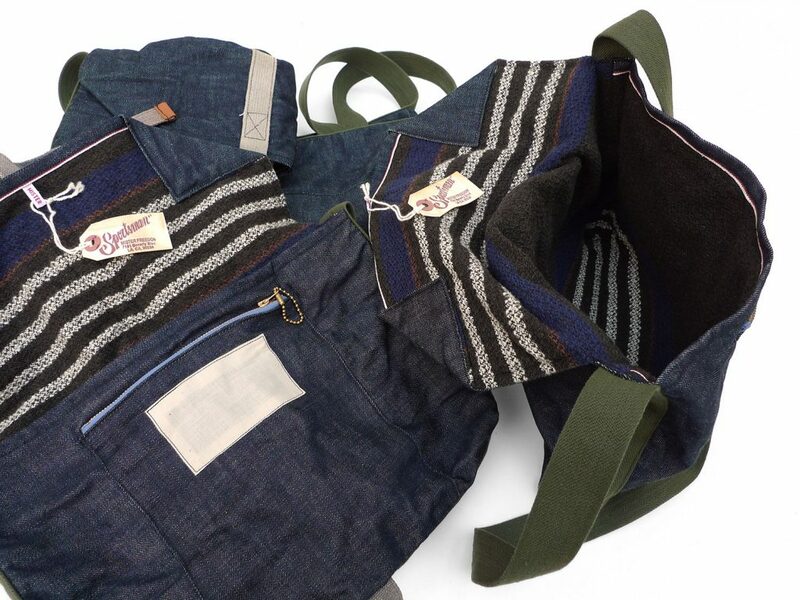 NOS selvedge denim twills for the shell, NOS wool-blend woven stripe blanket for lining, recycled vintage EU military grey cotton straps for flap closure, and NOS 1966 US Government-issued olive drab webbing for the shoulder strap. The zips are vintage cotton tape NOS 1960s-70s TALON metal zippers. There are NO overlocked seams, all clean seams inside and out, with a concealed use of the denim selvedge. Designed and manufactured in California by Mister Freedom®, in limited quantities, until NOS supplies last. 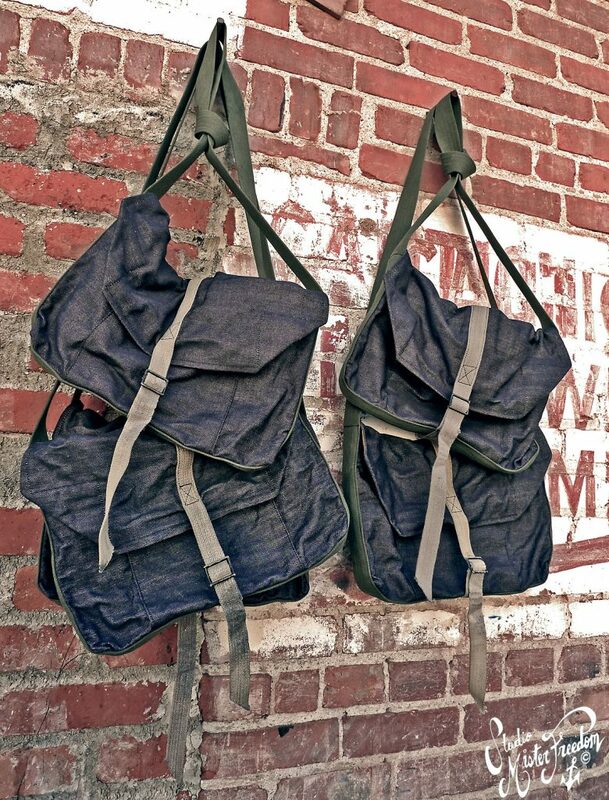 PATTERN: An original Mister Freedom® pattern, inspired by early French military WW1 musettes, ‘bread pouches’, and other military personal effect haversacks. 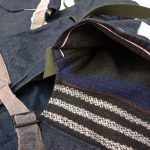 * Shell: NOS selvedge indigo denim, assorted origins (USA and Japan), about 12.5 Oz. * Lining: NOS wool-cotton and recycled fibers blend woven stripe blanket. 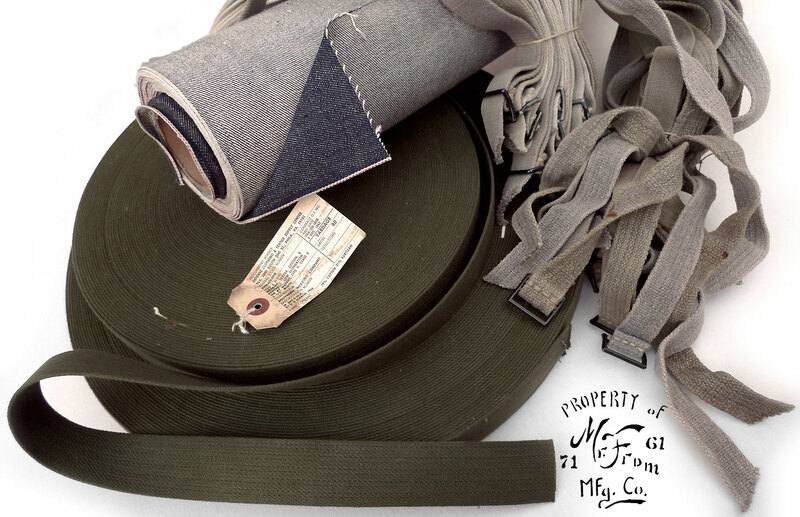 TRIMS: Vintage 1966 NOS military cotton/fortisan shoulder strap and recycled military closure strap with hand stitched metal buckle. 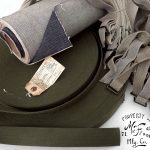 LABELING: No outside labeling, but an ID cotton patch under the flap, ready for your custom markings. STITCHING: Sturdy cotton-wrap poly thread. 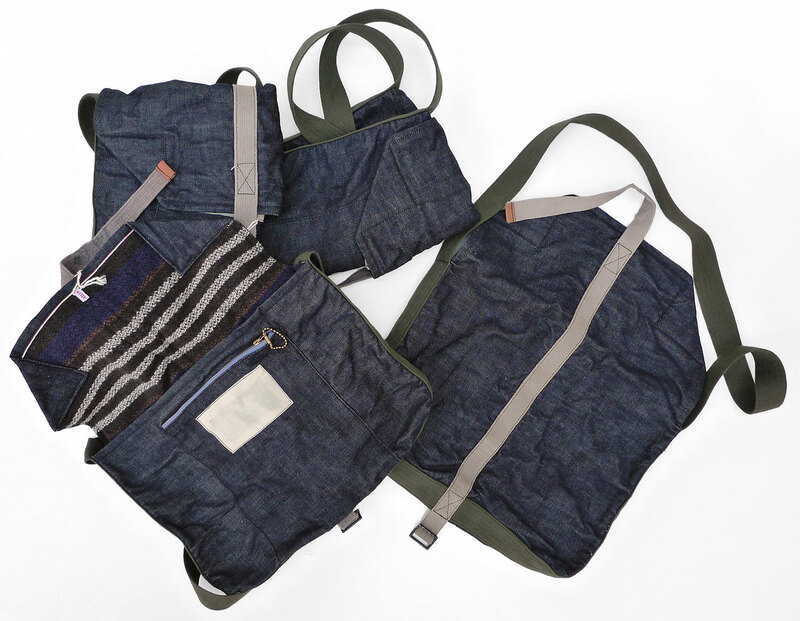 This denim Laptop Haversack comes pre-soaked/line-dried, ready to use. Cold wash when needed, gentle cycle with minimal environmentally friendly mild detergent. We recommend turning the bag inside-out to avoid marbling of the denim. Fold the shoulder strap inside the bag to avoid entangling in the washing machine. Do not use heat dryer to avoid potential excessive shrinkage. 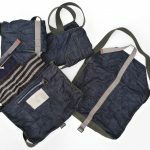 Available from www.misterfreedom.com and our Los Angeles brick & mortar store.